Imatec Dry Minilab Photo paper with Glossy and Matte surface, grammge with 240gsm and 260gsm. 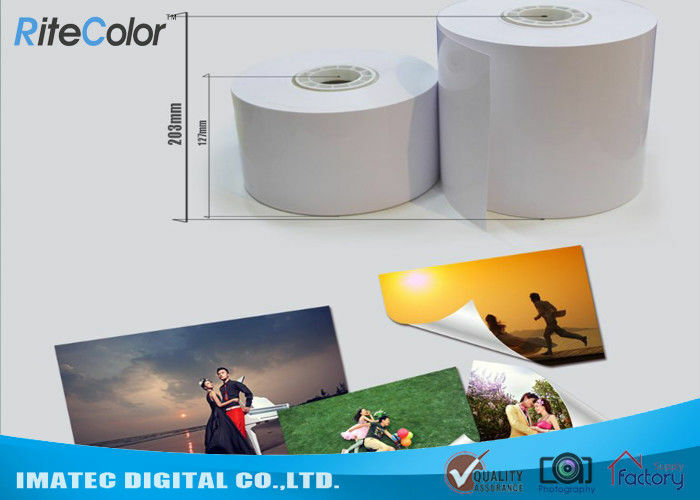 It is a high quality RC photo paper with a gloss / matte finish. It was designed and optimized for use in inkjet minilabs and microlabs to achieve not only an excellent image quality, but to ensure a smooth transport without paper jams in such minilab printers. The minilab photo paper with RC Coating, and shows good flatness. With a weight of 240gsm / 260gsm it offers a true photo feel with high robustness against creases or other mechanical damages. Compared with most most OEM Papers, Imatec minilab photo paper is more thicker, feels superior and much economical. The Minilab Photo paper of us is 100% compatible with Dye and Pigment inks, used in the dry minilabs of Epson (SureLab SL-D700 and SL-D3000), Fujifilm (Frontier S-DX100, DL600/650 and SL-D3000), as well as Noritsu (QSS Green / Green II, D705/703, D502 and 1005HR).